In 1968, the Golden West Open Freeskating Championships were created. Up until that time, all skating competitions allowed only those who placed among the top eight in figures to compete in freeskating. Many skaters never had the opportunity to perform their programs, so the competition, which was open to all levels, proved to be extremely popular. Figures were added during the 1980s but were later removed, continuing the freeskating-only format used today. In 1997, the club was pleased to host Junior Olympics, which is now known as Junior Nationals. Other qualifying competitions hosted by All Year include the 2004 and 2007 Pacific Coast Adult Sectional Championships. It’s slated to host the upcoming 2014 Pacific Coast Adult Championships. But the highlight of the club’s history was hosting the 2002 State Farm U.S. Figure Skating Championships at Staples Center. The 2002 Nationals Committee — Doug Williams, Valerie Lundy, Carol Hunt, Larry Kriwanek and David Simon — organized what at the time were the most successful championships to date, and All Year’s 21 competitors that year came away with eight medals. All Year has been represented at the World Championships by Scott Williams, Sharon Carz, Doug Williams, Scott Wendland, Trifun Zivanovic, Angela Nikodinov, Beatrisa Liang, Rena Inoue and John Baldwin Jr., Richard Dornbush, Madison Chock and Rockne Brubaker, and at the Olympics by Scott Wendland, Beata Handra, Rena Inoue and John Baldwin Jr. In fact, when Rena and John competed in pairs at the 2006 Winter Olympic Games, they entered the figure-skating history books by landing the first-ever throw triple axel at the Olympics. As of June 1, 2012, the All Year FSC has moved its principal rink location to Center Ice in Ontario, CA. 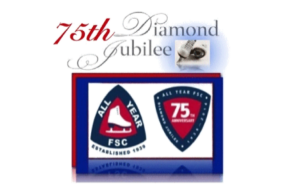 A celebration was held in 2014 for the 75th Diamond Jubilee of the All Year FSC. All Year is proud of the accomplishments of all its members and looks forward to their continued success and history-making performances.